Born in Glasgow on 26th April 1952, Frank Clement has been British 1500 and Mile record holder, British Champion and Olympic finalist. A member of Bellahouston Harriers for his entire racing career he has also competed in all Scottish championships on track and over the country as well as representing his club – and for a time Strathclyde University – in the famous Edinburgh to Glasgow Relay race. There were never any airs or graces about Frank – he is a straightforward, direct person who never ever at any time, not even when trading records with Steve Ovett, had a bad word about anyone. An example: after a disappointing SAAA marathon in Edinburgh when I had to drop out when running (for me) quite well with a recurrence of tendinitis, I went into the cafeteria at Meadowbank and turned round to look for a table when a voice from the far wall said that I was looking fed up. It was Frank. When I told my tale of woe, he just told me to cheer up – it had been the Olympic trial the previous week and he couldn’t run because of illness. It kind of put my minor problem into perspective. A better example by far is that of a 12 year old Alex Wilson standing by the finishing funnel at the Senior National Championship asking the top runners as they came in for their autographs. Alex says “Most stumbled right by me, up to the eyes in lactic acid – all except Frank and Andy McKean. Frank kindly obliged even though he was gasping for oxygen. What a cool dude!” Click on the thumbnail for the full autograph, written 32 years ago and kept since then. Club: Bellahouston Harriers and Linithgow Athletics Club. Occupation: Retired from Sport and Recreation Manager with Glasgow City Council. 1500 m 3:35.66 1978 Edmonton C.G. How Did You Get Involved in the Sport Initially? At school aged 15 years our teacher Dan Clancy got the class to go out running rather than play football. From this a team was selected for the Glasgow Schools Cross-Country Championships and we trained for three days a week for four weeks. The team came in first, second and third and we went on to win the Scottish Schools Championships as well. Initial inspiration was Jim Ryun. Robin Sykes, Bellahouston Harriers, guided me through my teenage years. Training with and encouragement from Mike Mclean was of great benefit. Watching Lachie Stewart, Ian Stewart and Ian McCafferty during 1970 Commonwealth Games nailed my commitment. It has given me a great deal. Initially enjoyment and self satisfaction and then fun, friendship and great opportunities to see the world: a career in sport and further enjoyment as a coach and official as I have aged. Delighted that over the years the sport has become more professionally organised and managed and that excellent facilities are now available with good support for athletes. Some disappointment that fewer young people seem interested in taking part, that performance standards in some events have slipped and that the sport does not now attract significant media attention. Front running an invitation 800 metres in Athens in 1973 in 1:46.0 seconds beating the UK record holder, Andy Carter. Failing to reach the European Championships 1500 metres Final in Rome in 1974. What Do You Do Apart From Running To Relax? I don’t run any more but try to get out on my bike twice a week (weather permitting). Some of my best times were posted in 1978 (aged 26 years). Injury and subsequent back surgery in 1979 put an end to my career when I felt I still had better performances to deliver. What Has Running Brought You That You Would Not Have Wanted to Miss? I met my wife through running – she was also a member of Bellahouston Harriers. We have five daughters and so far eight grand-children. There were two quite distinct periods to my career. 1970 to 1975 when I averaged around seven sessions per week and then 1976 to 1978 when I increased this to give an average of ten sessions per week. Wednesday 8 Miles lunchtime 10 x 300 grass; 5 Miles at night. Frank first drew himself to the attention of the wider British athletics public in January 1972 when at the age of 19 he became the first Scottish winner of the AAA’s Indoor Championship at Cosford in 3:46.3 which was a championship best. Only those who have seen the track at Cosford will be able to fully appreciate the feat: a 220 yard track laid in a corner of a massive aircraft hangar on an RAF base. The bends were quite tight, the arena was draughty and it was not a good place to go for a fast time. Scottish aficionados knew all about him – in 1971 he had been second in the SAAA 800 metres in 1:52.7 behind Ross Billson, and, still a Junior, was ninth in the 1500 metres ranking list. He had in fact been working his way through the ranks. His next major feat came in July 1973 when at the AAA’s Championship at Crystal Palace and leading the field out of the last bend, he was outsprinted by New Zealand’s Rod Dixon. Dixon’s time: 3:38.9, Clement’s 3:39.4. Being the first Briton across the line, he was the British Champion. In August that year, as a student at Strathclyde University, he won the World Student Games 1500 metres in Moscow in 3:42.3 and later that same month, in tandem with Brendan Foster in a GB team against Hungary, he ran 3:38.5 for the 1500 metres. He ended his season at Meadowbank on 8th September he ran one of his finest ever races when he won the Europa Cup 1500 metres in 3:40.8. He went to the front early on and just kept going to win by a distance. In 1973 he was awarded the Coronation Cup which is presented by the SAAA to the outstanding athlete of the year. In 1974 he set his first British record. In the GB v Sweden match in Stockholm on 30/7/74 he ran the 1500 metres in 3:37.4 (3:37.38 ) when he finished third. This beat Brendan Foster’s existing time of 3:37.64. He held the record for almost exactly three years until Mike Kearns ran 3:36:81 in 26/7/77. Exactly one year later, on 30/7/75, he set his second British record. This time it was for the mile, again it was in Stockholm and it was Peter Stewart’s record of 3:55.3 that he captured with 3:55.0 (actually 3:54.95 rounded up). 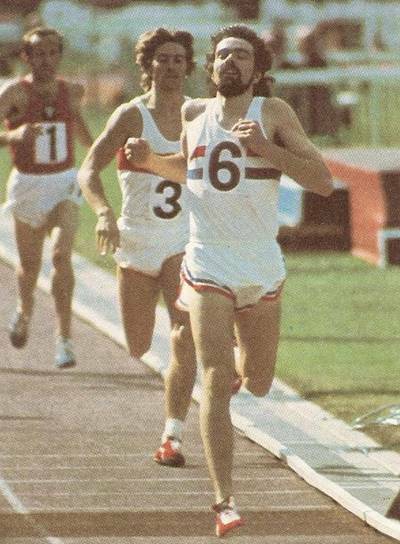 This lasted until Steve Ovett set a new mark of 3:54.69 on 26th June 1977 but Frank regained the record on 27th June 1978 when finishing ahead of John Robson in Oslo in 3:54.2. Robson recorded 3:54.3. Ovett then set new figures for the Mile of 3:52.8 on 20th September 1978. 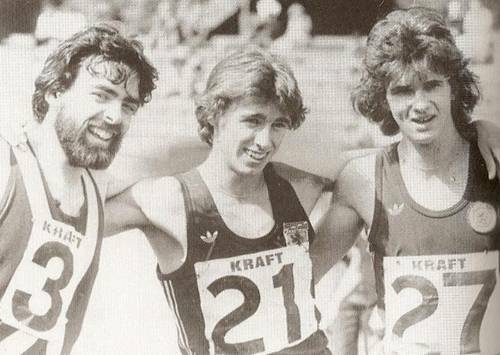 At the end of 1974 he and Dave McMeekin had the top 15 times at 800 metres of any Scot with Frank second in the SAAA event a mere one tenth of a second behind Dieter Fromm of Germany. This was his fastest time of the year and the 1:48.4 had him second Scot. In the 1500 metres he had the top four times and six of the top nine. The Scottish Athletics Yearbook compiler said: “Missing the Commonwealth Games because of University Studies and being surprisingly eliminated in his Heat at the European Championships due to illness, Frank Clement had a disappointing season in his quest for major championship honours. However after a slow build-up throughout the season, Frank broke the United Kingdom 1500 metres record with a superlative performance of 3;37.4 at Stockholm”. 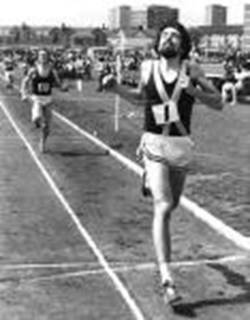 In the AAA’s Championships in 1975 he was runner-up to Danie Malan of South Africa in a time of 3:40.3 to Malan’s 3:38.7. 1976 was Olympic year and the official trials were at the Kraft Games at Crustal Palace on 12th June. Frank was third in 3:40.0 behind Ovett (3:39.6) and Moorcroft (3:39.9): three runners covered by four tenths of a second. There were lots of close finished in Franks career. In Montreal, Frank had a good Games. Before going to the Games he had defeated John Walker in an 800 metres in Zurich but misfortune on the final lap maybe cost him a medal. In the first round he was second to John Walker in a fast race in 3:37.5 to Walker’s 3:36.9; in the second semi-final he was fourth in 3:38.9. The final, on a damp afternoon, was a tactical affair with lots of bunching and jostling and in the final straight John Walker of New Zealand won in 3:39.2 with Frank only half a second behind in fifth place. He was the top Briton in the event and was coming on hard and fast at the finish: I remember him saying at a British Miler’s Club day at Huntershill in Glasgow that his plan had been to go at 1200 but in the race, with 300 yards to go he was knocked on to the grass and had to get back on to the track before he could get on with the race. What if he hadn’t been knocked at that point? He was finishing faster than any of the other finishers, if there had only been another five or six yards we all thought! If the BBC ever releases any of its Games tapes the Scottish public could judge for themselves! Doug Gillon reports that five metres past the line, he was first! He also ran in the 800 at the Games after running a first class time of 1:45.6 in Zurich where he was third. He had had a number of good performances at the event – eg in 1973 he ran 1:46 for an 800 metres in Athens and won the SAAA title comfortably with 1:48.1. However after winning his heat in the Games he was eliminated in the semi-final. The British Milers’ Club always does a report on the major Games meetings races in which they are interested – 800, 1500 and now it also does steeplechase and 5000 metres. Dave Cocksedge comments on John Walker’s tactics thus: “Was John Walker lacking confidence after being nailed by Frank Clement in the 800m heats? It certainly appeared so. He claimed after the race that he planned to attack over the last 500 metres but held back to the back straight…” As far as Frank is concerned he said: “Frank Clement too would benefit more from a strong pace, but possibly influenced by his improved 800m form this year, preferred to follow and try to kick. He won a World Student Games with a 52.2 second last lap in 1973, but was wrongly positioned to try a similar break at the bell this time. When he was ready to move, the decision had been made for him and he ended up playing the same catch-up game as the others all the way to the finish.” That was how it looked to a journalist and statistician in Autumn 1976; his report might have been altered slightly had he spoken to Frank but it does shed a different light on the race. Frank is often seen, not without reason, in Scotland as part of a trio of really outstanding international, record-breaking milers with John Robson and Graham Williamson being the other two. In a Heat of the AAA’s 1500 metres in 1977, Robson ran a pb of 3:41.1 and in the Final was was third in 3:43.8 with Clement fourth in 3:44.1. The three runners all turned out in the SAAA Championships in 1978 and after a fascinating race and a terrific two man duel, Robson won in 3:40.1, which was a Scottish Native Record, with Clement second in 3:40.5 and not far away was Graham (Date of Birth: 15/6/60) in 3:42.1 which was a UK 17 and 18 years age bests. The UK Championships were held at Meadowbank that year and the positions were identical with Robson’s time being 3:43.9. Given Frank’s ability it was inevitable that he was a notable runner on the road and over the country in winter. He ran in all the classic road races and relays such as the McAndrew Relay in October and the Nigel Barge in January and it would be impossible to cover them all, so this profile will look only at the National Cross Country Championship and the Edinburgh to Glasgow Relay which were the two main events in the Scottish winter season. A one club man, he ran in the National Cross Country Championships for Bellahouston Harriers other than when he was at Strathclyde University. He first turned out in the 1969 Youths (Under 17) race where he finished fourteenth and then in 1970 (again in the Youths age group) where he was fourth, one place behind Lawrie Spence and one ahead of Dave McMeekin – all three were to become serious senior athletes and all would break four minutes for the mile! As a Junior in 1971 he was fourth and in 1973 he was one place behind Dave McMeekin in sixth and was selected to run in the World Junior Cross Country Championship where he finished 34th. He missed the 1974 race and in 1975 he was ninth finisher in the Senior event and that merited selection for the World Cross Country Championship. In 1976 he was twenty eighth, he missed the race in 1977 but in 1978 he gained his third international vest when he was seventh in the championship. In 1979 he was down the field in 38th which was one place ahead of Jim Alder – the Scottish International team captain for many years and Commonwealth Games Champion. His first run in the Edinburgh to Glasgow was in 1970 when he ran on the second stage for Strathclyde University where he dropped one place from sixth to seventh. It is fair to point out though that this was regarded as the most difficult stage of the race and it was particularly so for first year Juniors. The following year he ran n the first stage which was a stage for racers – for the only time in the race all clubs started together and it was a straightforward race. Frank was fourth. Missing the 1972 race he had his last run for the University, this time on the fourth stage where he had the fastest time of the day and pulled the team up from 12th to 8th. It was back to Bellahouston Harriers in 1974 when he progressed from seventh to fifth on the second stage. On the second stage for the next two years he took over sixth and handed over in sixth in1975 and moved from sixteenth to fourteenth in 1976. 1977 was another good run when he ‘won’ the first stage. After missing 1978, he ran on the third stage in 1979 where he maintained ninth place and he ran his final Edinburgh to Glasgow in 1980 when he finished second on the first stage to F Aase of the Skalj club from Norway so he was unarguably the best Scot on the stage. He retired from the sport in 1980. Frank had to retire from the sport at the early age of 28 in 1980 because of a back injury and it was a serious loss to Scottish and British athletics. He then spent 26 years working for Glasgow City Council, mainly in the Leisure and Recreation Department where he was responsible among other things for the smooth organisation of the Glasgow Women’s 10K and of the Great Scottish Run and is one of four British contacts on the international AIMS list. He was always interested in raising the profile of the sport and when the British Milers’ Club wanted to stage one of their prestigious Grand Prix meetings in Glasgow Frank was the key local authority figure who gave all the encouragement he could and arranged for facilities and equipment to be made available. It was a tremendous success and came to Glasgow for three years. He was also active in the organisation of Scottish Athletics and spent four years as Chairman of that body. When he was appointed in March 2000, Doug Gillon reported it. “Frank Clement, the former European Cup 1500 metres champion and 1976 Olympic finalist, is the man chosen to resurrect the fortunes at the Scottish Athletics Federation. Currently sports development manager for the Culture and Leisure Services Department of Glasgow City Council, Clement is believed to have beaten off contenders including leaders of the hill-running faction, which recently overturned the membership scheme.” Frank was no stranger to working with national governing bodies – he had been a member of the SAAA General Committee in the late 1970’s – but this one was a difficult one. The whole structure of Scottish athletics had been changed in the mid-1990’s and many of the new schemes and innovations had not gone down well with the clubs. The attitude of Scottish Athletics to these complaints was seen as negative by the clubs and with the appointment of Frank, there was an attempt to heal the rifts. Frank undertook to visit any club in the country which wanted to discuss anything with the governing body and he crossed and re-crossed the country, meeting club committees and members, listening to their comments and requests and taking the information back to Edinburgh. This was a huge task and Frank did it well. In addition to a day’s work it was even bigger with a lot of late nights and travelling involved. Honours have been showered on him and we can’t go through the list but as a taste – in 2010 at the Glasgow Lord Provost’s Awards Dinner he received the Sports Prize, he is a Life Member of Scottish Athletics (awarded in 2003), a life member of the Sports Council for Glasgow as well as a host of other awards. Frank moved to Linlithgow where he lives with his wife and daughters. He is a member of the local athletics club, Linlithgow AAC where for a while he was an active coach and a real asset to the club. If you would like to see Frank’s annual progression then go here . Although he doesn’t run these days, he has a couple of road bikes in the garage and gets out a couple of times a week. Consultancy work and spending time with the grandchildren take a lot of his time.